Problemas? Head to Llantera San Borjas in El Rosario. There’s a nice, busy Pemex station as you enter El Rosario from the north. 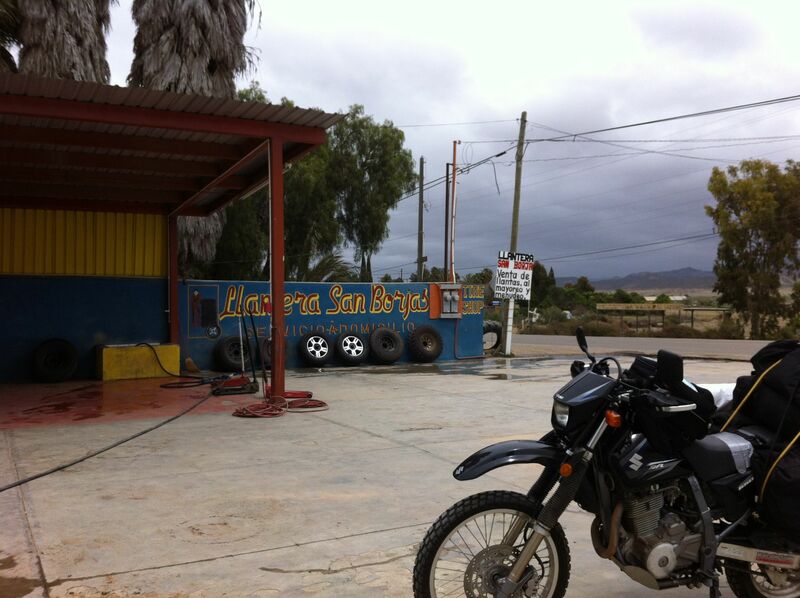 This is an important gas stop in Baja, as the next Pemex station isn’t for another 200 miles. There’s gas by the can midway, at Catavina, and more in Punta Prieta, although the latter is difficult to find, but those only have “magna sin” (unleaded regular), and the Pemex in El Rosario has premium. Most are reluctant to get gas from the can. 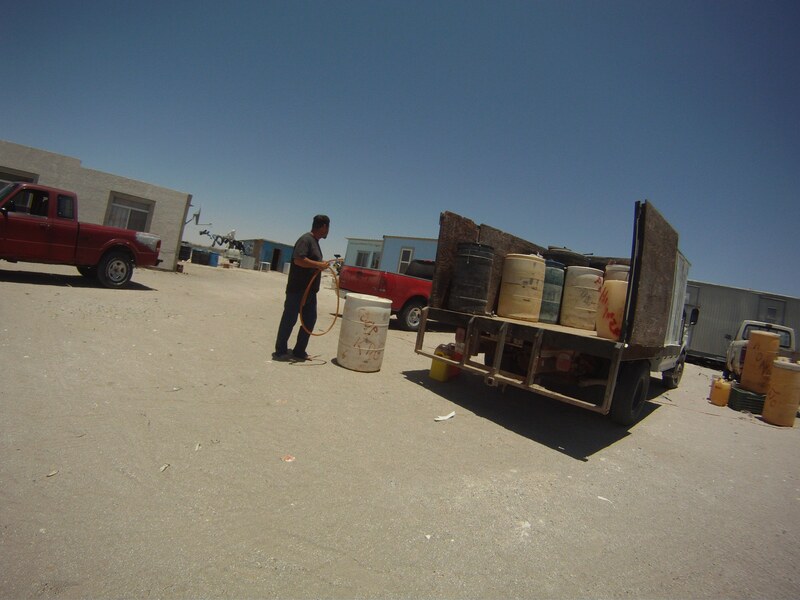 I’ve filled up in pueblas, fishing villages, and everywhere else they’ll sell you gas from the can, and have not had a problem once. I can’t say the same for the Pemex in El Rosario. Gas from the can. Fishing village Laguna de San Ignacio. Magna sin only. Less than a mile after filling up on Premium, while still in second gear to avoid getting a ticket in town, the DR started sputtering, then died. It would start, but sputter and die in seconds. It had to be the gas. What else could explain this? Turn around in the direction of the gas station. Start pushing. After a 100 yards or so I get to the Llantera San Borjas, owned by a guy from LA, which was fortuitous, as I can speak some Spanish, but not enough come breakdown time. We talked it over and decided it was the gas, of course. They figured I hadn’t watched closely enough and filled up on regular instead of premium. I was quite sure I got premium. Regardless, we decided to drain most of the gas and refill. This went for my extra gallon loaded in a bag on my tail rack. With much gas drained and the tank nearly empty I tried starting the bike hoping I could get it to sputter enough to make it to the gas station and save the boys a trip with the gas can. The DR started, and ran. And ran and ran. I made it to the Pemex without a stutter. The answer had arrived. Whatever was bad about the gas was at the bottom of the tank. Which means it was water. There was water in the gas. I pulled up to a different island for a completely different pump, loaded up on premium, again, and was on my way. No problema. In Catavina I filled the DR up with regular for the first time. She ran fine. And for the next 1,500 miles or so I filled up mostly on regular, as that’s all that was available. Not a stutter. Next time I won’t drain as much gas. There was probably less than a cup of water in the tank. Also, if you’ve never drained your gas, you need to put the petcock in the Prime position, otherwise it won’t drain.